When you're trying to lose weight, no one diet fits all. Whether you're trying to cut carbs, eat more protein or limit your fat intake, it all works, as long as you're cutting back on the calories. It's more about finding a diet that fits your lifestyle and personal taste. Consult your doctor or dietitian to discuss the right plan for your specific weight-loss needs. To be clear, ratios, such as 3-to-1 or 2-to-1, are not used when determining how much protein, fat and carbohydrate you should eat to lose weight, but percentages often are. The Dietary Guidelines for Americans report provides percentage ranges for these essential macronutrients, which allows for flexibility when creating a diet plan that best fits your needs. In 2009, researchers from the Harvard School of Public Health published a study in the New England Journal of Medicine investigating the best macronutrient percentages for weight loss in a group of obese and overweight individuals. The participants were assigned to one of four diets with varying percentages of fat, protein and carbs, and were followed for two years. Over the two-year period, the participants in the study lost about 10 percent of their usual weight and improved their heart health. The researchers found that weight loss, hunger control and diet satisfaction was similar -- no matter which diet the participant followed. The authors concluded that calorie-restriction resulted in weight loss, regardless of the breakdown of protein, fat and carbohydrates. While the NEJM study reported no difference in weight loss with the different macronutrient ratios, some evidence exists that getting more protein in your diet may be helpful when you're trying to lose weight. According to a 2008 review article published in The American Journal of Clinical Nutrition, a higher intake of protein may help improve satiety as well as increase body heat, which in turns increases your metabolism and helps you maintain muscle. The 2010 Dietary Guidelines for Americans offers a range of protein for overall good health: 10 percent to 35 percent. For weight loss, you may benefit from getting a higher percentage of your calories from protein. The Dietary Guidelines also stipulates a suggested range for carbohydrates: 45 percent to 65 percent of calories. The 2009 NEJM study followed a group limiting their carbohydrate intake to 35 percent of calories. To prevent illness and ensure that you meet your vital nutrient needs, the recommended dietary allowance recommends that adults eat no less than 130 grams of carbs a day, which, on a 1500-calorie diet, translates into 35 percent of the total calories consumed. Like protein and carbs, you have no one specific amount of fat to reduce to lose weight. The Dietary Guidelines suggest 20 percent to 35 percent of calories from fat for overall good healt. Fat is also a source of fat-soluble vitamins, including vitamins A, D, E and K, and provides essential fatty acids, which are important for vision, the nervous system and cell membranes throughout your body. ChooseMyPlate.gov suggests 5 to 7 teaspoons of healthy fats per day, which includes fats within some foods, such as nuts. However, when you're trying to lose weight, keeping to the lower end of the range is wise for calorie control. While it's a good idea to know how much protein, carbs and fat to include in your diet, what really matters when you're trying to drop extra pounds is the quality of the foods you eat. A high-quality food is one that is minimally processed and rich in essential nutrients, such as fresh fruits and vegetables, whole grains and healthy fats and protein, instead of processed foods, such as white bread, sweets, fast food and processed meats such as bacon. 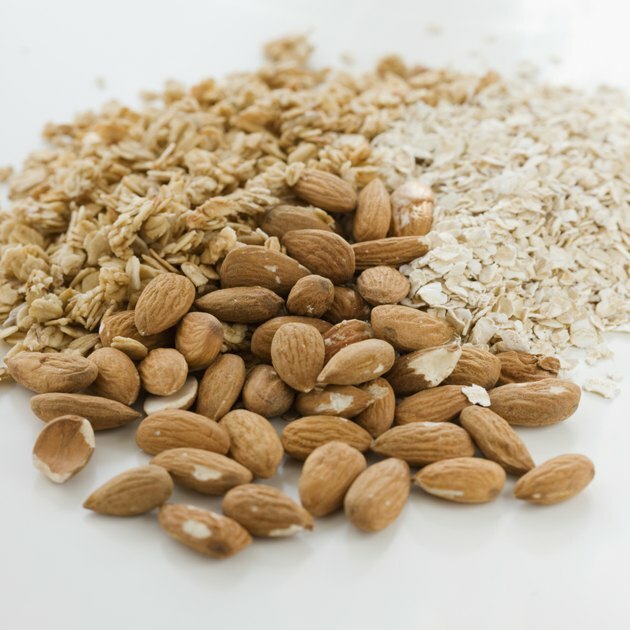 For example, refined grains and whole grains are both sources of carbs, but whole grains -- such as oatmeal and whole-wheat bread -- are a natural source of nutrients that promote health such as fiber, vitamins and minerals. High-quality foods, according to the Harvard School of Public Health, are beneficial for losing weight because they help limit calorie intake. It's not just food quality, though; portion control also counts when you're trying to lose weight. Eating the right portion of food, even the healthy ones, is also necessary for keeping calories under control for weight loss.